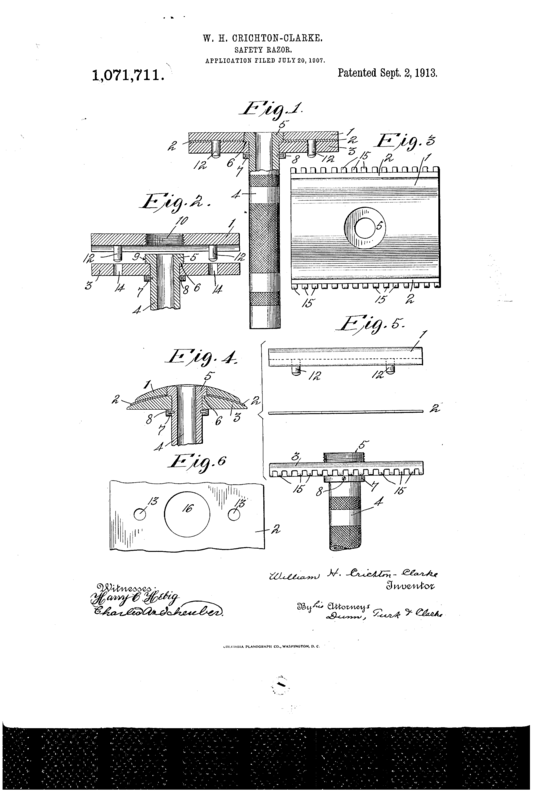 In 1907 William H Crichton-Clarke - most likely working for Gillette - patented what he described as a useful improvement in safety razors... in particular an improvement to simplify and reduce the number of parts in the razor. The last three pieces is permanently joined together into one unit. If the only objective was to reduce the number of parts the handle could have been machined out from a single piece. However this approach would make a heavier razor which used more metal to make, thus likely making it more expensive to manufacture and ship. William choose a different route, creating a razor which would retain the hollow handle and reduce the number of parts by... hmm.. one. Instead of having a threaded stud on the top cap that threaded into the handle, the top cap now have the female end of the thread, and is screwed onto the threaded end of the handle. The base plate is secured to the end of the handle by means of a collar, which in turn is held in place by a couple of tiny bolts or pins. Quote: A razor comprising a cap having a threaded opening, a guard, and a handle rotatably swivelled on the guard and having an enlarged threaded extension at its upper end projecting above the guard and adapted to engage the threaded opening of the cap, and means for preventing axial movement of the handle relative to the guard. One major benefit I can see from a manufacturing perspective is the fact that you no longer have to fit together three separate pieces to make the handle. The machining should also be a bit more straight forward. The major downside I can see is visible in the lower left corner of the drawing; The blades would have to change. And while the 'new' blade - with the enlarged centre hole - might work on the old razors, the old style blade would not fit in this improved and simplified safety razor. And that is probably what killed this project when all is said and done. A god bit of the history of these remarkable devices called safety razors. As any inventor and investor will tell you, a patent is not the map to a treasure chest.